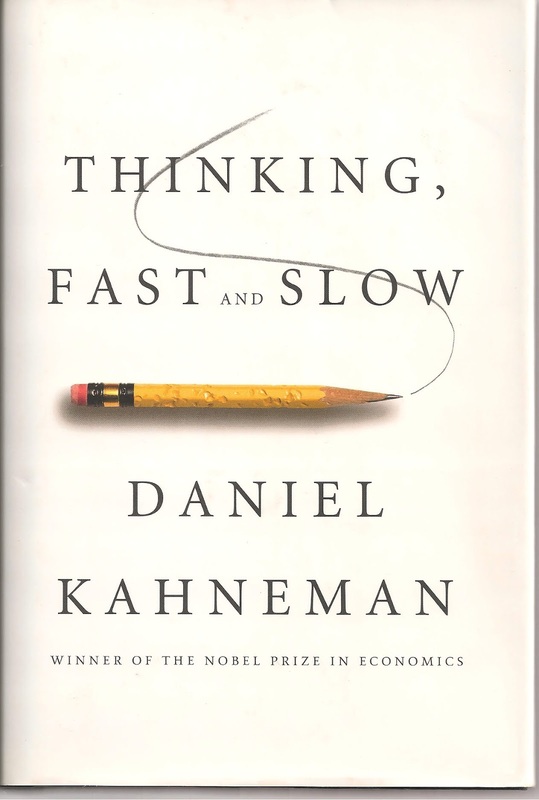 Subject: "Thinking, fast and slow"
I started out thinking (fast) that Daniel Kahneman's book "Thinking, Fast and Slow" was a book about the thought processes of two different types of people: one type which thinks "fast" and the other type which thinks "slow." It turns out that everyone thinks both "fast" and "slow." "Fast thinking" is basically an automatic reaction. I.e., you jump when hearing a loud noise. "Slow thinking" is done when you need to figure things out or need to be very careful. I.e., someone asks you what the last four digits of your social security number are. Everybody does both types of thinking, but we don't always do them under the same circumstances. An English teacher might automatically correct someone's English without thinking. It's a habit resulting from years of teaching. It's also an example of "fast thinking." A person who is not an English teacher might not even notice the grammatical error unless they were trying to figure out something about the person talking. Then they might utilize "slow thinking" to conclude that the grammatical error is an indicator of minimum schooling, or basic carelessness, or a fascinating mistake by someone whose native language is not English. The "fast thinking" part of your brain will continue to tell you that the top horizontal line is longer than the bottom horizontal line even though you've measured the two lines every possible way, and the "slow thinking" part of your brain knows beyond any doubt that the two horizontal lines are the same length. Biases are generally the result of "fast thinking." No matter what the facts and evidence say, we may stick with our biases and ignore the facts and evidence. Of course, I had to start wondering if this could somehow help explain why Truthers and conspiracy theorists of all types routinely accept their biased beliefs as being true and correct, and no amount of facts and evidence can change their minds. Is some automatic part of their brain seeing things that a little bit of "slow thinking" would very quickly show to be nothing but misunderstandings? Or are they so accustomed to making decisions using biased "fast thinking" that they are no longer capable of realizing that they could be wrong? Truthers, of course, feel the same way about me. They argue that I am so biased toward believing everything "the government" says, that I mindlessly accept every claim and statement - without any thought of any kind. And then, of course, a moment later, they'll criticize me for disagreeing with the FBI's testimonial evidence that Dr. Ivins somehow disguised his handwriting when he wrote the anthrax documents. They argue I accept everything the government says while at the same time arguing that I do not accept everything "the government" says -- which they probably see as evidence that even I do not trust "the government," proving that the "the government" should never be trusted. No matter what the facts and evidence say, they'll spin everything to fit their "fast thinking" biases. They are not incapable of "slow thinking." They use it every day to figure out how to twist things to make them fit their "fast thinking" biases. To figure out what is true and correct, you have to evaluate and compare the EVIDENCE for ALL SIDES. I constantly try to get others to do that. But Truthers and conspiracy theorists absolutely REFUSE. Instead, they argue that they do not BELIEVE the government's evidence and that the government's evidence doesn't meet their personal standards for evidence (or it isn't really evidence and only people who have been brainwashed think it is). There seems to be no way to get past such "fast thinking" biases.